TO PRE-COOK THE RICE: BRING A LARGE POT OF SALTED WATER TO A BOIL. ADD RICE TO THE BOILING WATER, AND COOK UNTIL AL DENTE, APPROXIMATELY 12 MINUTES.DRAIN RICE, AND SPREAD LIGHTLY WITH YOUR FINGERS ON A BAKING SHEET TO COOL (THIS HELPS IT RETAIN ITS AL DENTE TEXTURE). ALLOW TO COOL. TO PREPARE THE DISH: POUR OLIVE OIL INTO A PAN OVER MEDIUM HEAT AND ADD SMASHED GARLIC. LET THE GARLIC COOK, INFUSING THE OIL, UNTIL LIGHTLY GOLDEN. BE CAREFUL NOT TO BURN IT. REMOVE GARLIC FROM OIL, THEN ADD RED PEPPER FLAKES. CIRCLE THE PAN WITH A SPLASH OF COOKING WINE, THEN ADD FISH STOCK. ADD A COUPLE GRINDS OF PEPPER TO THE PAN. DROP IN THE CLAMS AND COOK FOR 2–3 MINUTES UNTIL THE CLAMS HAVE OPENED. DISCARD ANY THAT STAY CLOSED. 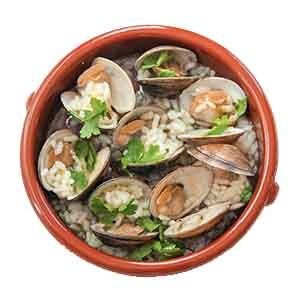 POUR THE COOKED RICE INTO THE PAN LIKE RAIN, SHOWERING THE COOKED CLAMS AND BUBBLY STOCK. SALT TO TASTE, THEN REPLACE THE LID AND LET REST FOR 5 MINUTES SO THAT THE RICE ABSORBS THE FLAVOR OF THE DISH. BEFORE SERVING, SPRINKLE ON AS MUCH FLAT-LEAF ITALIAN PARSLEY AS YOU WISH.